As with most of my how-to and craft books, I document everything as I learn and do projects myself. That documentation plus step-by-step photos becomes an ebook, so I can share the instructions with others. 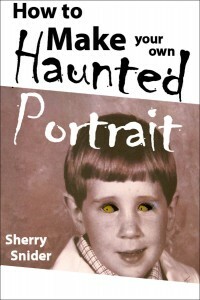 How To Make Your Own Haunted Portrait is a step-by-step guide to making your own paranormal art for your haunted house or your home sweet home. The detailed and illustrated instructions in the book are all you need to create your own creepy pictures with eyes that follow you. All the materials are listed (with photos). All the steps are detailed (with photos), and all the fun happens during and after the making. It’s fun (and creepy) to watch grandma’s eyes follow you. It’s even more fun to watch others stare at grandma’s eyes following them across the room. Now imagine a portrait of your favorite writer or your favorite characters from TV, movies, and books watching YOU. Fun! Even better, imagine telling ghost stories around the fireplace with Edgar Allan Poe following your every move. Put one in your guest room! Haunting as it is, the illusion is actually fairly easy to recreate. It’s based merely on depth perception and angle. Similar customized portraits sell online from $25 and up. …MUCH up if you want to have a personal photo converted. If you want to create your own Eyes-Follow-You portraits, this little ebook is for you. Whether you want a haunted portrait because you love Disney, the haunted mansion, haunted houses, illusions, crafts, or just the novelty, with these instructions, you can easily create an eerie illusion of your own. That Picture is Watching Me! One of the most unnerving yet beloved illusions in haunted houses around the world is the spine tingling feeling of passing by a picture…sure that the eyes are following you as you pass. Haunting as it is, the illusion is actually fairly easy to recreate. It’s based merely on depth perception and angle. Similar customized portraits sell online for $25 and up…MUCH up if you want to have a personal photo converted, but you can easily do it yourself for a fraction of the cost and customize the details exactly as you like. If you want to create your own Eyes-Follow-You portraits, this little ebook is for you. Whether you want a portrait because you love Disney, the haunted mansion, haunted houses, illusions, crafts, or just the novelty, you can bet that with these instructions, you can easily create an eerie illusion of your own. If you have all the materials on-hand, the process of making your own Haunted Portrait takes approximately 30 minutes to 1 hour depending on how much care is taken with detail. How do you see writing a a craft book or tutorial as different from writing other genres of books? Craft books and tutorials are very different from other genres. Clear photos and illustrations are particularly helpful to “show” the instructions as described. Too, the material is educational or instructional, so lists, bullet points, and 3rd person are common. Walk through each project and procedure yourself to make sure it always works properly. This is also a great opportunity to set up for photos. Other than that, think in terms of teaching. How would you “show” someone how to do this? How would you explain it? What questions might the student have? Answer all those questions in the book with accurate descriptions and illustrations. I live for the how-to junkies…the folks (including myself) who always ask, “How did you do that?” I always document, and I love to share. I usually choose to self publish how-to and craft ebooks, so I can keep the prices low and accessible to the small-niche readers interested in learning. Sherry Snider, Technical Writer evolved over years of teaching (English, reading, & speech), then, working in the IT (Information Technology) field. After documenting hundreds of technical processes and teaching others how to duplicate results, technical writing and training became the next logical career path. After many happy years of corporate employment as a documentation specialist and technical trainer, opportunities for independent contract and freelance work opened even more doors including documentation and training projects ranging from school and transit bus parts through HAZMAT procedures. Sherry still takes technical writing, multimedia, training, and consulting projects in a variety of industries. Though hardware (assembly, troubleshooting, repair, etc.) and software (user manuals, admin manuals, developers’ guides, etc.) are usually her favorite projects, pretty much any customer with cool toys and tech to master has a good chance of capturing her interest…especially if her specific experience and skills offer significant value to the project or customer/client. Sherry also shares her silly/fun projects and children’s books under the pen names, Wendy Tush and PJ Thyme. Since the reading audiences for children’s books and technical/academic works are entirely different, pen names were definitely necessary to separate Sherry’s bibliography into distinct genres. All of Sherry’s books are available on Amazon published by Cottaquilla Press.